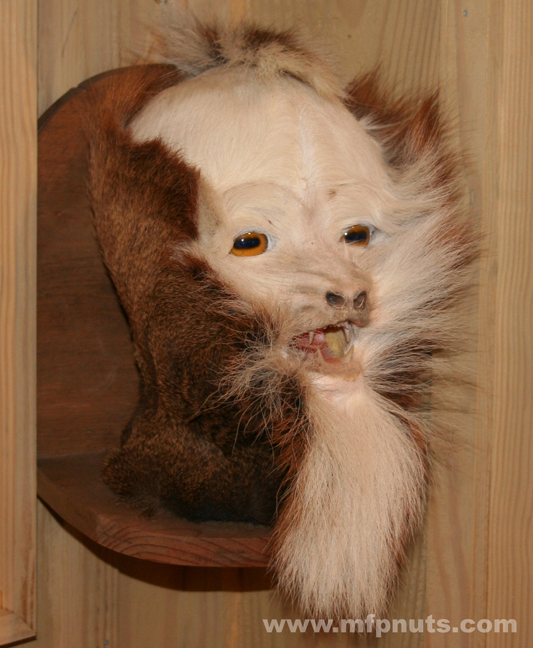 The Albemarle Creeper head specimen displayed before you is the only known specimen collected by modern man. The Creeper’s primary established territory lies within the ancient juniper swamps bordering the Southern Albemarle Sound and Roanoke River Delta. This creature, the most elusive and secretive of all animals inhabiting juniper swamps, exhibits an uncanny chameleon- like ability to take on the appearance of juniper tree bark… which makes it virtually impossible to distinguish from the surrounding trees. Local legends from indigenous peoples have long been used to explain the mysterious disappearances of those lost late at night in the vast juniper swamps of Eastern North Carolina. Suppressed reports from the post-colonial era mention disappearances of individuals in the swamps such as hunters, surveyors, bootleggers, and timber cruisers. Traditionally, those disappearances have been attributed to alligator, panther, or black bear encounters, but bears, alligators, and panthers always leave physical evidence behind in the form of bones, clothing fragments, and victims personal gear. When a Creeper encounter occurs, no physical evidence is ever found of the victim…they just seem to disappear from the face of the earth. Stories passed down through generations of local timber families, involved in the harvesting of juniper trees, reportedly tell of finding human bones, belt buckles, clothing remnants, knives, and old firearms contained within the boles of the tree trunks when the logs were cut into boards. It is speculated that responsibility lies with the Creeper and the victims served as a food cache for the Creeper. What do we know about the Albemarle Creeper? Inhabits primarily Juniper swamps. Also found in Cypress swamps, but prefers Juniper. Can manipulate its fur and facial hair to replicate the bark of Juniper and Cypress, and can actually change the color shade of its fur to make it indistinguishable from the tree trunk. Is nocturnal. It dens in old-growth hollow juniper and cypress trees, where it stays during daylight hours or during extreme weather such as hurricanes and extended freezes. It has a seasonal symbiotic relationship with hornets. Den trees will always contain a hornets nest near the den entrance. It is believed the hornets protect the den entrance by day and the Creeper protects the den tree by night. Is carnivorous. Primary diet is frogs, possums, snakes, fish, lost children, and lost individuals. It makes a nocturnal cry which is best described as a “Squaller” (which is a combination of a squall and a holler). The Creeper squaller has been reportedly to cause loss of control of bodily functions by those that have heard it. Super human strength. Weighing in under 100 lb. Some of its victims had an estimated weight in excess of 200 lbs prior to their disappearance. Tracks are often mistaken as deer tracks, but upon close examination the track will have a third toe which leaves a very slight impression. The toes on the hoof have retractable claws much like a panther which it apparently uses in tree scaling, food procurement, and defense. The facial hair is most unique in that the white hair of the face can be engulfed (covered) by the brown hair that protrudes from the side of its head, and by the brown hair on the underneath of the goatee protruding from its chin. Has nocturnal vision with large yellow cat-like pupils. Eyes are super sensitive to focus light beams at close range (less than 10 ft.). This Creeper made his last creep in Chapel Swamp of Washington County, NC on January 1, 1993. After surviving a night encounter with the Creeper while crossing Chapel Swamp, I was able to return during daylight hours to retrace his tracks. I finally identified the Creeper’s tracks, which so many others had mistaken for deer tracks. Since the Creeper was also a tree climber, the tracks would end once the Creeper left the swamp-bottom for the treetops. The Creeper’s survival intelligence is nearest to that of man, more than any other creature. So upon leaving the ground, the Creeper would travel the necessary distance through the treetops to prevent anyone from tracking it to its den tree. A freakish winter ice storm that prevented the Creeper from masking its tracks and forced it to seek its den tree from the ground was the precipitate to the final events. The ice storm had struck during the night while the Creeper was away from the den tree. With ice covering all of the tree limbs and branches, the Creeper could not travel via the treetops, and thus it approached its den tree on foot! The claw marks in the ice-covered bark finally pinpointed the Creeper’s den tree. From this point the Creeper’s demise commenced. The most difficult challenge was building a fire to smoke it out into the open. Knowing that I was about to confront the legendary Albemarle Creeper, I could take no chance with weaponry. I loaded my .308 caliber rifle with one conventional round and two special rounds, one contained a silver bullet and the other a wooden bullet. When the Creeper emerged from its den, I fired. The first two rounds struck it in the chest. The Creeper’s reaction was a raging squaller accompanied by a furious charge in my direction. As it lunged the final distance toward me, I fired again and the third bullet—the wooden bullet—struck its chest as well. The Creeper crumpled in mid air. Motionless and silent, the only sound I heard was the adrenaline pounding in my ears and my own rapid breathing which was causing a cloud of vapor to form about me in the freezing air. The Albemarle Creeper laid slain. Chapel Swamp is now safe!…Maybe?